Aggressive advertising messages aimed at children urging them to purchase goods for the game “Runes of Magic” are not permitted, the German Federal Court ruled. The Federation of German Consumer Organizations (VZBV) sued game maker Gameforge because it tried to sell armor and weaponry directly to children, the VZBV said in a news release on Thursday. The offer was made on the Runes of Magic website. After a link was clicked, a Web page offering various products was opened, the VZBV said. Direct exhortation to children in this way is prohibited, ruled the German Federal Court on Wednesday, said court spokeswoman Dietlind Weinland in an email on Thursday. Therefore, Gameforge should refrain from using terms like “grab the opportunity to...” while advertising paid in-game items to children, Weinland said. Runes of Magic is a game that can be downloaded for free. Gamers can then purchase upgrades and accessories in the game to advance, the VZBV said. By marketing paid items in a game that make the participation more attractive, game makers exploit the inexperience of children, said the VZBV. 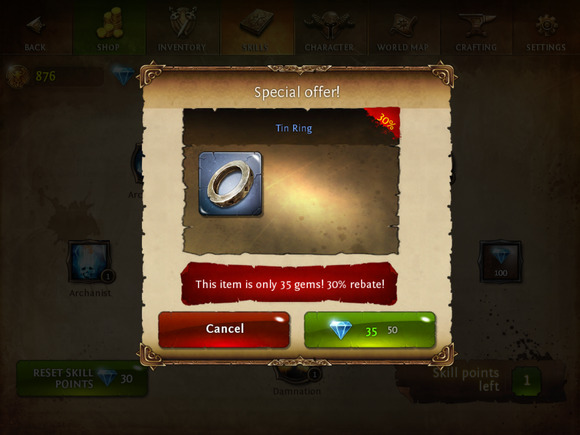 But the ruling means that advertising messages aimed at children with a link to paid accessories for the computer game “Runes of Magic” is not permitted, the VZBV added. The virtual goods have to be paid for with real money, the federation said. In 2009 for instance, purchasing 3,000 diamonds for Runes of Magic cost the player almost €100 ($130), while a riding animal could be bought for 199 diamonds, it said. The decision of the court is not yet final, Weinland said. Since the defendant was not represented by counsel before the Federal Court, a “default judgment” was given, she said. The company can oppose the decision within two weeks, after which the matter would be considered further by the Federal Court, she said. If the verdict is not opposed it will enter into force. Gameforge on Thursday did not immediately comment on the verdict. People in the game industry have been discussing the marketing of game items to children for a while. “Children in some cases are being monetized MUCH more aggressively with in-app purchases than adults are, because developers understand that children are more vulnerable and wish to profit on this. There is nothing illegal about this in any country that I am aware of,” said Ramin Shokrizade, an Applied Virtual Economist and Monetization Designer who consults game makers, in an email on Thursday. Game maker Zynga for instance uses a technique that is called “fun pain” to entice gamers to purchase items. Shokrizade currently consults to companies with a combined market capitalization of over $300 billion worldwide, according to his LinkedIn profile. Game maker Zynga for instance uses a technique that is called “fun pain” to entice gamers to purchase items, he wrote in a recent blog post titled Monetizing Children. “The idea is to inflict some very uncomfortable situation on a player in their game, and then offer to remove that situation in return for money. While the vast majority of adults will make the assessment that it is in their best interest to not spend the money and to just exit the application that is designed to hurt them, it is biologically harder to come to this conclusion if the decision maker is a child,” Shokrizade wrote in the blog post. Therefore, the use of real money or its equivalent should be removed as an option in games without the explicit informed consent of parents, Shokrizade said in his blog, adding that children are not in a good position to judge the value of purchases in virtual currencies. “I don’t think in app purchases (IAPs) belong anywhere in games marketed to minors. If your response is ‘oh that is going to make it a lot harder to sell microtransactions’, then I’m going to suspect this is an admission that you know children are more vulnerable to suspect monetization methodologies,” he added in his blog. It is inevitable that some companies will move toward even more aggressive exploitation of children in games, wrote Shokrizade. “To solve the problem governments and people need to first understand the problem,” he said in his email. The ultimate result will be national regulation, which is already happening in some parts of Asia, he added.